The coupe’s styling, performance, and craftsmanship help position the vehicle as one of the brand’s flagship products  LC 500 utilizes and defines the brand’s new architecture that promises which enhanced dynamic capability and performance. A symbol of an evolving vehicle development culture that embraces heightened collaboration between Design and Engineering teams. The LC 500 was driven by a strong, appealing fundamental design target (LF-LC), and engineering teams worked tirelessly to find new solutions to maintain as much of the concept in the production car as possible. Likewise, vehicle designers were very involved from the earliest stages of the dynamic development process to understand the engineering targets and collaborate with design viewpoints and potential solutions. With LC 500, additional levels of prototype vehicle build also allowed both teams to better study design or engineering ideas and refine key elements . The new Multi Stage Hybrid System marries the elements of a traditional full hybrid powertrain -including a 3.5 litre V6 petrol engine, a powerful electric motor and a lithium-ion battery pack to a 4-speed automatic gearbox mounted at the rear of the hybrid transmission. The electric motor generates better acceleration feel than a conventional engine, and adding physical gears more closely aligns engine rpm with the driver’s inputs. 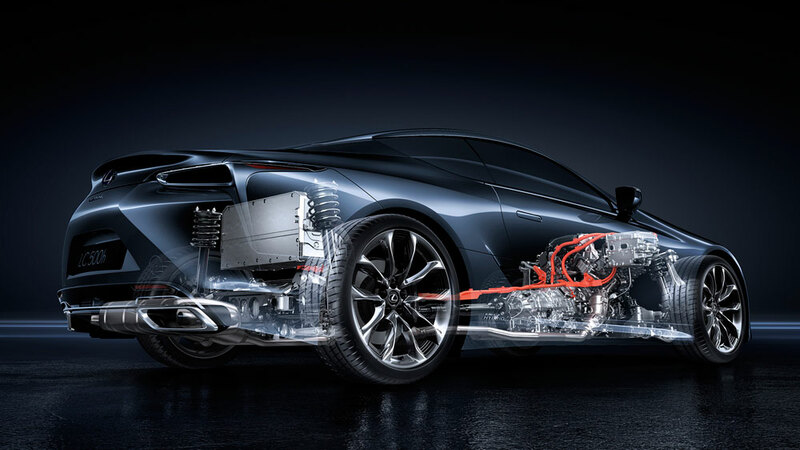 The Lexus Multi Stage Hybrid System also features ‘M’ Mode—the first driver-initiated gear shifts offered on a Lexus full hybrid powertrain. ‘M’ Mode gives drivers the ability to initiate direct and responsive gear shifts for the most sporting and engaging drive yet from a Lexus hybrid.